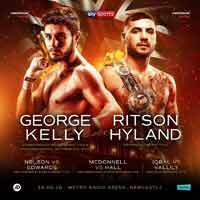 Review by AllTheBestFights.com: 2017-09-30, good fight between Stuart Hall and Paul Butler 2: it gets three stars. The former Ibf Bw champion Paul Butler entered this fight with a pro boxing record of 24-1-0 (13 knockouts) and he is ranked as the No.24 bantamweight in the world. He suffered his only loss when he faced Zolani Tete in 2015 (=Tete vs Butler), since then he has won seven consecutive fights beating Carlos Ruben Dario Ruiz in his last one. His opponent, Stuart Hall (former Ibf bw champion as well), has a record of 21-5-2 (7 knockouts) and he entered as the No.14 in the same weight class. He lost to Lee Haskins last year (=Haskins vs Hall 2) but he came back to win in 2017 defeating Jose Aguilar. In their first bout Butler beat Hall via split decision (June 7, 2014 – Hall vs Butler I). Watch the video and rate this fight! Review by AllTheBestFights.com: 2016-04-16, close fight with some tough exchanges: Stuart Hall vs Rodrigo Guerrero gets three stars. The former Ibf super-Flw champion Rodrigo Guerrero entered this fight with a pro record of 24-5-1 (16 knockouts) and he is ranked as the No.12 super bantamweight in the world. He suffered his last loss when he faced Daiki Kameda in 2013 (=Kameda vs Guerrero), since then he has won five consecutive bouts beating Fernando Aguilar in his last one. His opponent, the former Ibf Bw champion Stuart Hall, has an official boxing record of 19-4-2 (7 knockouts) and he entered as the No.58 in the same weight class. He lost two consecutive fights in 2014, against Paul Butler (=Hall vs Butler) and Randy Caballero (=Caballero vs Hall), but then he has won three bouts. Guerrero vs Hall is on the undercard of Josh Warrington vs Hisashi Amagasa. Watch the video and rate this fight! Review: 2014-10-25, nice toe-to-toe fight between Randy Caballero and Stuart Hall: it gets three stars. The undefeated Randy Caballero entered this fight with a perfect record of 21-0-0 (13 knockouts) and he is ranked as the No.13 bantamweight in the world, he has fought once in 2014 beating Kohei Oba in one of the best boxing fights of the year (=Oba vs Caballero). His opponent, Stuart Hall, has a record of 16-3-2 (7 knockouts) and he entered as the No.29 in the same weight class but he comes off a draw against Martin Ward (=Hall vs Ward) and a loss against Paul Butler (=Hall vs Butler). Caballero vs Hall is valid for the vacant IBF bantamweight title; undercard of Martin Murray vs Domenico Spada. Watch the video and rate this fight! 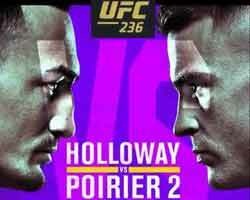 Review: 2014-06-07, pretty good fight between Stuart Hall and Paul Butler: it gets three stars. Stuart Hall entered this fight with a professional boxing record of 16-2-2 (7 knockouts) and he is ranked as the No.15 bantamweight in the world, he suffered his last defeat in 2012 when he faced Lee Haskins for the vacant EBU (European) Bw title, since then he has collected four wins and one draw winning the Ibf belt in 2013 against Vusi Malinga (=Hall vs Malinga). His opponent, the undefeated 25-year-old Paul Butler (9 years younger than Hall), has a perfect record of 15-0-0 (8 knockouts) and he entered as the No.49 in the same weight class, he has already fought in 2014 defeating Oreste Bernabe Nieva in a fight valid for the vacant WBA Inter-Continental Bw title (=Butler vs Nieva). 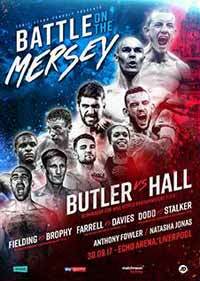 Hall vs Butler is valid for the IBF bantamweight title (Hall’s second defense), first world title shot for Butler; they also faced each other a second time on September 30, 2017 (=Paul Butler vs Stuart Hall 2). Watch the video and rate this fight! Review: 2014-03-29, pretty good start but the fight between Stuart Hall and Martin Ward was too short and in this case we can’t give more than two stars… Stuart Hall entered this fight with a professional boxing record of 16-2-1 (7 knockouts) and he is ranked as the No.18 bantamweight in the world, he comes off four consecutive wins and in his last fight he won the vacant IBF bantamweight title defeating Vusi Malinga via unanimous decision (=Hall vs Malinga). His opponent, Martin Ward, has an official record of 18-2-0 (4 knockouts) and he entered as the No.63 in the same weight class, he is 26 years old (8 years younger than Hall) and this is his first world title shot. 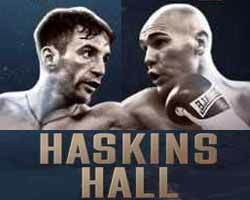 Both fighters have lost to #23 Lee Haskins in their career but Stuart Hall was defeated via unanimous decision while Ward by tko in the fifth round. Hall vs Ward is valid for the IBF bantamweight title (Hall’s first defense). Watch the video and rate this fight! Review: 2013-12-21, good fight between Stuart Hall and Vusi Malinga: it gets three stars. Stuart Hall (15-2-1, 7 KOs) entered as the No.33 bantamweight in the world while Vusi Malinga (21-4-1, 12 KOs) entered as the No.36. Hall vs Malinga is valid for the vacant IBF bantamweight title. Watch the video! Review: 2011-09-03, nice fight between Jamie McDonnell (17-2-1) and Stuart Hall (11-0-1). McDonnell defeated Stuart Hall by unanimous decision winning the Commonwealth (British Empire), EBU (European) and BBBofC British bantamweight titles. Jamie McDonnell entered as the #21 bantamweight in the world while Stuart Hall entered as the #19 bantamweight. Watch the video!